India are on track to win the first Test against Australia after another dominant day in Adelaide on Sunday. After setting the hosts 323 to win, India reduced Australia to 104-4 at stumps on day four, still needing another 219 runs for an unlikely victory. 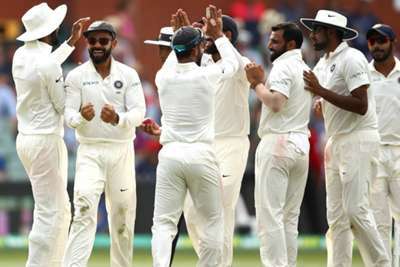 Australia's batting issues were again exposed, mostly by Ravichandran Ashwin (2-44), as Shaun Marsh (31 not out) found some form to provide a little resistance. Earlier, some careless batting saw India bowled out for 307 in their second innings as Nathan Lyon (6-122) starred with the ball for Australia. The tourists seemed to have given Australia some hope after losing 73-7 to finish their innings. But the hosts' batting struggles continued despite a promising start, although Aaron Finch only just survived on the second ball of the innings after replays showed Ishant Sharma (0-19) had overstepped when trapping the opener lbw. Just as Finch and Marcus Harris had helped Australia reach 28, the former fell on the stroke of tea. Finch (11) was given out caught by Rishabh Pant off Ashwin, opting not to review despite replays showing no sign of the delivery hitting the opener's glove. Harris, who had already been dropped, then fell for 26 after a poor shot, chasing a wide one from Mohammed Shami (2-15) and edging behind to Pant. Usman Khawaja (8) struggled before losing patience, lofting an Ashwin delivery to Rohit Sharma for what was another poor dismissal. Peter Handscomb departed for 14 after a badly timed pull shot off Shami and while Marsh and Travis Head (11) reached stumps, Australia were left in trouble. Earlier, India had looked comfortable after resuming at 151-3 as Cheteshwar Pujara (71) and Ajinkya Rahane (70) put on an 87-run stand for the fourth wicket. But just as they seemed set to take the game completely away from Australia, India collapsed courtesy of some aggressive and careless batting. India went from 234-3 to 307 all out, with only Pant (28 off 16 balls) able to add anything of note aside from Pujara and Rahane's contributions. Lyon was the best of Australia's bowlers, picking up his 13th Test five-for, but their batting again let them down as they were left in serious danger of defeat.